Sara Rahbar channels her own painful experiences to express the suffering of humanity through her work. 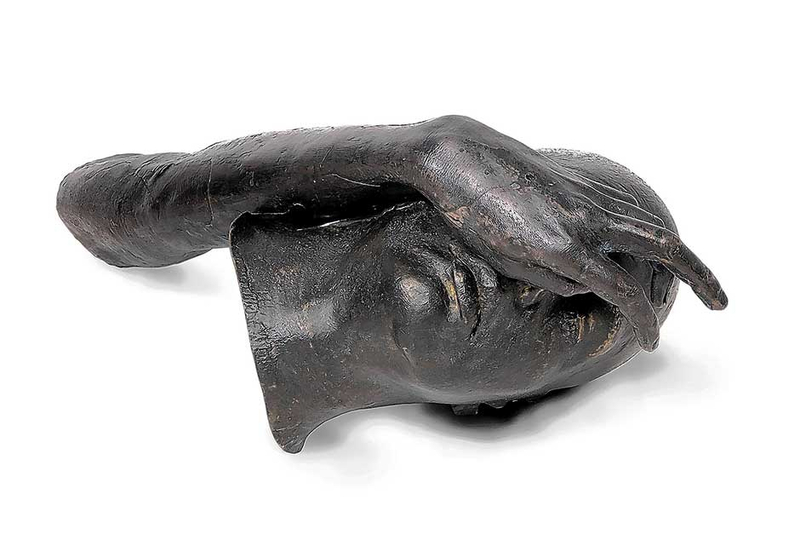 In her latest show in Dubai, Salvation, the New York-based artist from Iran is exhibiting a series of bronze sculptures of broken and twisted bodies that speak about the pressure, pain, vulnerability and hopelessness that ordinary people cope with in their daily lives. “The world is so dark today that like me, a lot of people are anxious, stressed out and desperately looking for salvation. These heavy, fragmented figures speak about the weight of the world and the despair of those who are struggling to survive,” Rahbar says. In her signature style, the artist has incorporated in her artworks, chains, tools such as welder’s tongs and military equipment such as bullet straps, helmets and rucksacks bought from second hand army stores and flea markets. “These objects represent ordinary people who work very hard but just manage to make ends meet. With no savings, or safety net to support them, they are caught in a vicious cycle of working themselves to the bone, with no option to stop, or to step outside the limitations imposed by their situation. Sadly, soldiers too fall in this category of workers, as indicated by the number of homeless war veterans living on the streets of New York,” Rahbar says. 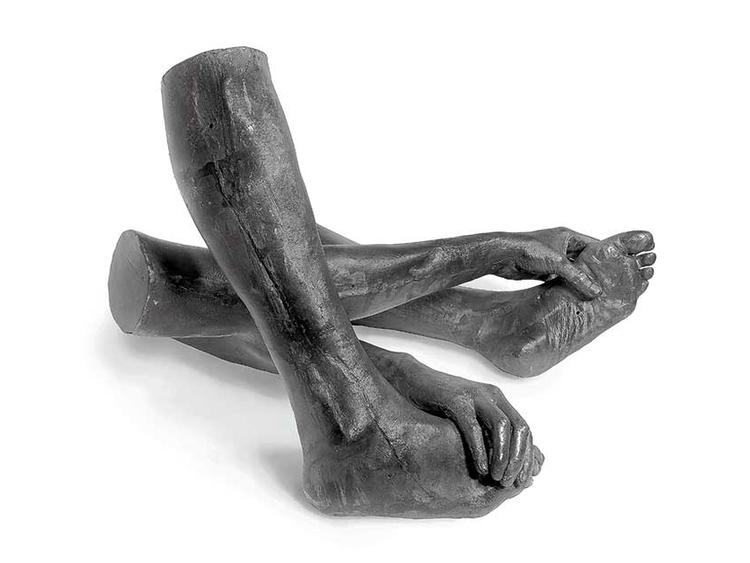 The severed limbs, dangerous looking tools and war references in her sculptures, and their titles that sound like desperate pleas for help, reflect the impact of war, and political turmoil around the world. 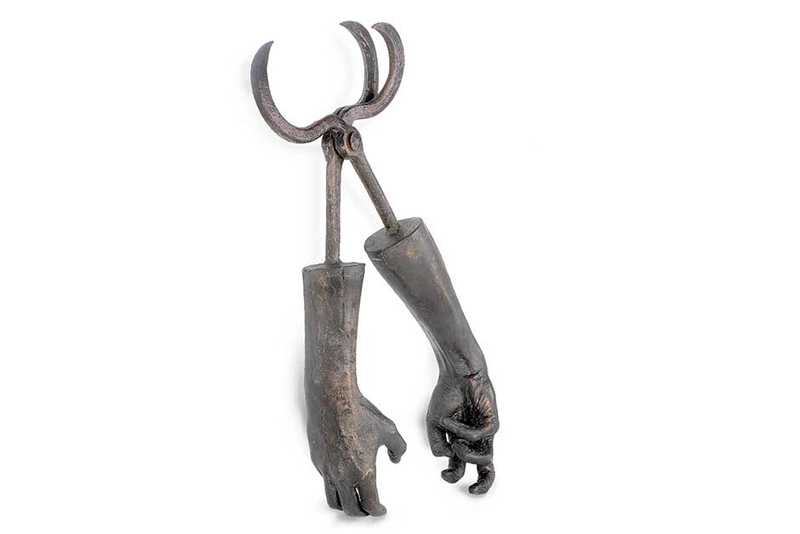 In a piece titled, Refuge, a detached hand makes a futile attempt to protect a decapitated head in an instinctive reaction to danger; Another work, I Won’t Let You Go, features several pairs of severed hands clinging on to each other in a hopeless bid to hold on. In Carry Me Home, the stance of the limbs suggests that a person has collapsed and is unable to continue. Similarly, Comfort Me, featuring a body pushed against the wall, feet barely touching the ground, and toes clenched, also indicates a person, who is choking under pressure. “I tend to curl my toes when I am tense, which is most of the time. But this is not about me. I am not the only one searching for comfort in this world,” the artist says. 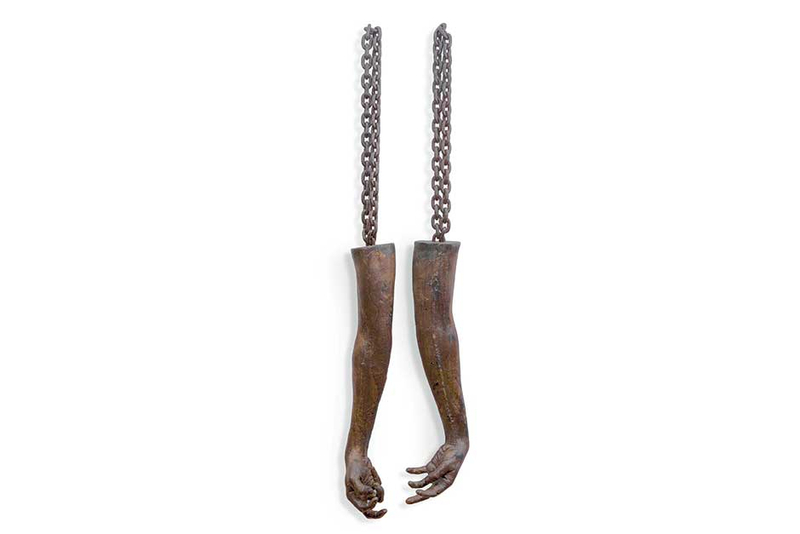 Chains are a recurring motif in Rahbar’s work and appear in this show in works such as Seperation, featuring heavily scarred arms dangling from chains, with the hands frozen as if in an anxiety attack. “I have terrible memories of seeing people I love bound in chains in prison, and of chained animals. Chains represent slavery, confinement and control, and make me very upset, but I use them in my work so that viewers can feel the sense of discomfort they cause,” she says. Rahbar is known for her series of colourful flags that make powerful political and social statements. She has made a new, not so colourful piece for this show, featuring an American flag covered with pieces of military rucksacks with name tags of soldiers, bullet cases, uniforms of white collar workers such as gas station attendants, coins and pieces of jewellery from different countries, religious icons and other found objects. “This flag is a record of the history I have witnessed since I came to the US, and represents the workers and soldiers whose toils are forgotten by society,” Rahbar says. The piece after which the show is named, features a pair of dismembered arms hanging above a pile of helmets placed on the floor. “One hand is open and trying to grab something, while the other is crippled, but their movement is limited by the tool they are attached to. The helmets are cast from military helmets from the two World Wars. The work conveys the feeling of exhaustion, giving up, surrendering and desperately searching for salvation and freedom from pain, shame and guilt,” Rahbar says. In a world where the privileged majority in Western democracies is also feeling the helplessness and fear that minorities have always felt in a racist society, Rahbar’s fragmented, bound and suffering figures are a reminder of how important it is for all of us to speak up and act against the injustice and inequality we see around us. Salvation will run at Carbon 12 gallery, Alserkal Avenue until May 10.